Acid washing your pool every few years is an excellent way to keep stains off the pool tiles. It is also an effective solution for black algae and helps in removal of unsightly calcium deposits. The general rule of thumb in the pool industry is to drain and change your pool water every 5 years or so. Pool water accumulates Total Dissolvable Solids (TDS) over the years. TDS are essentially foreign elements in the water that have negative effects on plaster. These impurities embed themselves into the plaster and show up as stains and streaks. The resulting stains can be very unsightly and damage the longevity of plaster. Our goal is to treat a pool every five years with a Muriatic acid wash. We drain the pool and spa completely of the contaminated water. We follow up with a mixture of muriatic acid, fresh water and a water soluble gel. These three components are then poured over the entire pool and spa where the tile meets the plaster. The mixture pulls out impurities and aims at restoring plaster to its natural state. We can do this process over white plaster, grey plaster, 3M, and even pebble tech. This is also a great way to ensure preventative maintenance and prolong the life of the plaster. 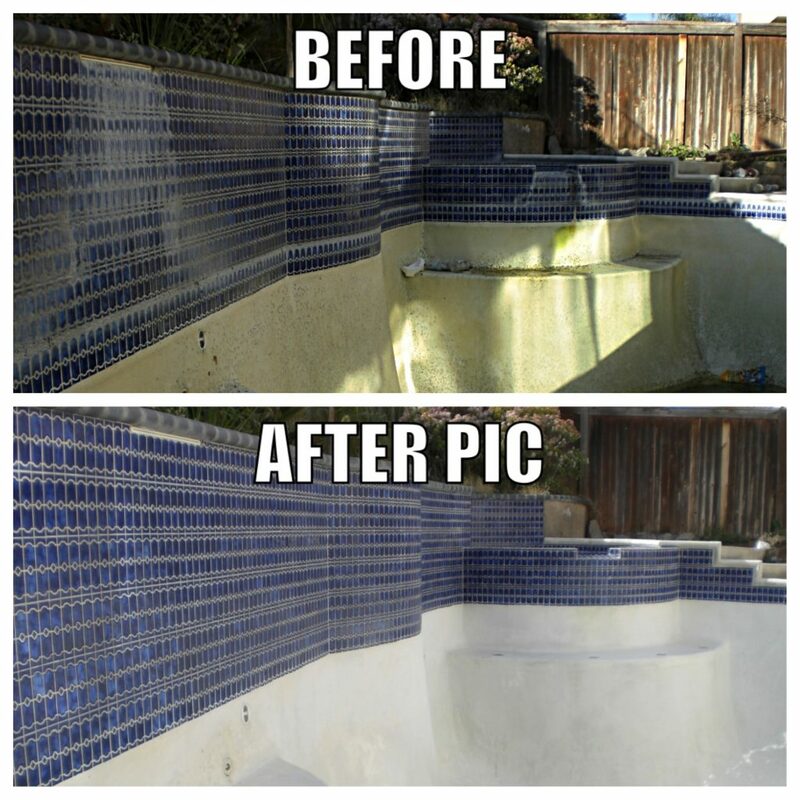 Pool Rehab uses the mildest chemicals possible and non-abrasive techniques to acid wash your pool and restore its beauty. The gap between pool structure and decking is caulked with a sealant, typically mastic or deck-o-seal®. While these sealants are pretty resilient, they tend to lose their strength over the years. When a pool is first built the installation of mastic is a very important and key element in preserving the structural integrity of the pool. New mastic’s major role is to serve as a flex joint between the new coping and the new deck. This allows movement as the pool settles in the first few stages of its life. What we are trying to prevent is the coping and deck moving in unison, thus causing cracks in the concrete, coping to shift out of place, tiles dislodging, and pool gunite damage. Pool mastic doesn’t last as long as the structures it protects. 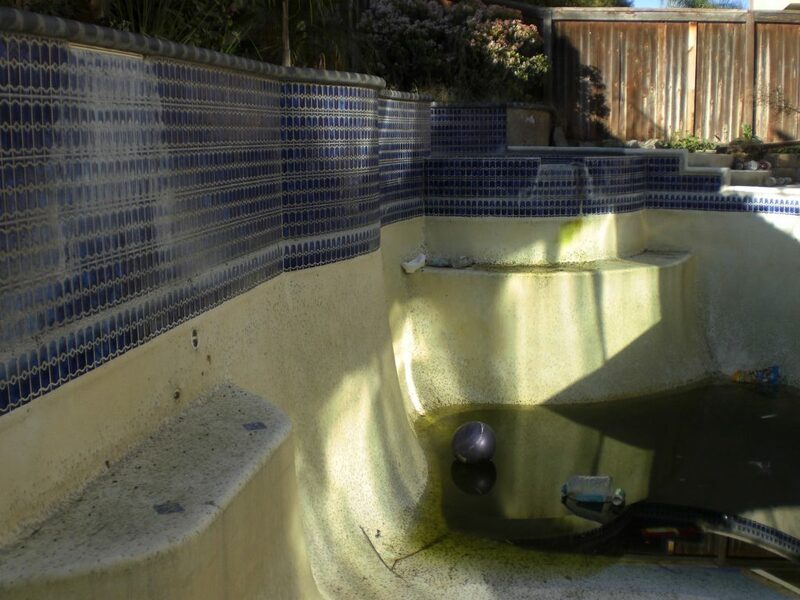 Our service consists of removing and replacing old mastic around pools and spas. We first remove the old mastic with a reciprocating blade. Separating the old material from the deck and the coping. Once we dispose of the old mastic, we prep for the new mastic. This entails pouring 30 grit sand into the void we have created between the deck and coping. This allows an even, and new surface for the new deck o seal to be installed. The new mastic is a self leveling liquid. Upon installation we must use special care and attention as to not “over pour” mastic on either existing coping or deck. This is a time sensitive material to work with, as it will cure at an exponential rate. Once new mastic has been poured in any area that needs repair, the final step is to coat the fresh mastic with a layer of sand. This has two affects. Primarily the sand will mix with the deck o seal and create a tougher bond. This will help combat the expansion and contraction that is inevitable with the changing of temperatures through the seasons. Secondly it gives the mastic a textured appearance that will blend in with existing grout lines and majority of coping and decks. As part of the pool mastic repair service, Pool Rehab caulks the gap between pool coping and deck with brand new sealant to prevent any damage to the bondbeam or pool. 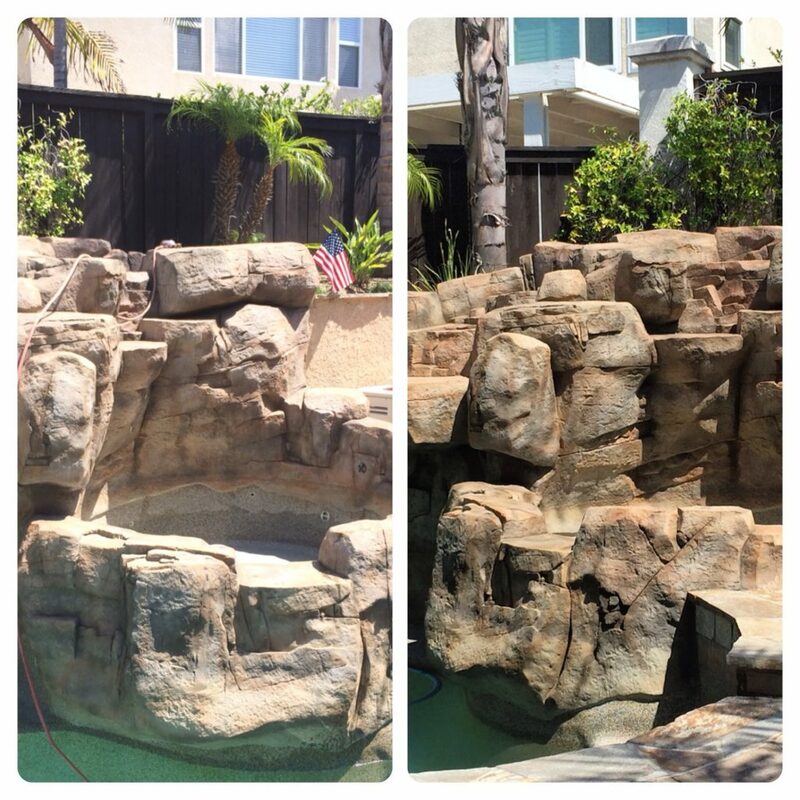 Pool tile cleaning or Pool artificial rock paintingshould to applied to make the swimming more beautiful. Calcium builds up over time on any surface. I.e. Clay tile, glass tile, stone, artificial rockscapes. It can build up on pool water line as well as any vertical structures where water movement is present. Pool chemistry plays a major role in the timeline of how quickly calcium becomes present. When a customer doesn’t have the resources or time to battle the war on calcium in the pool, it becomes beneficial to hire a professional pool tile cleaning company. 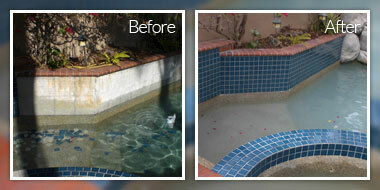 We specialize in the removal of calcium, and restoration of pools and spas. We have the capability to use a number of materials to remove calcium. High quality products and the best equipment available in our industry helps us to achieve unprecedented results for our customers. We leave our customers with a clean pool and in a position to manage their pool cleanliness for summers on end. 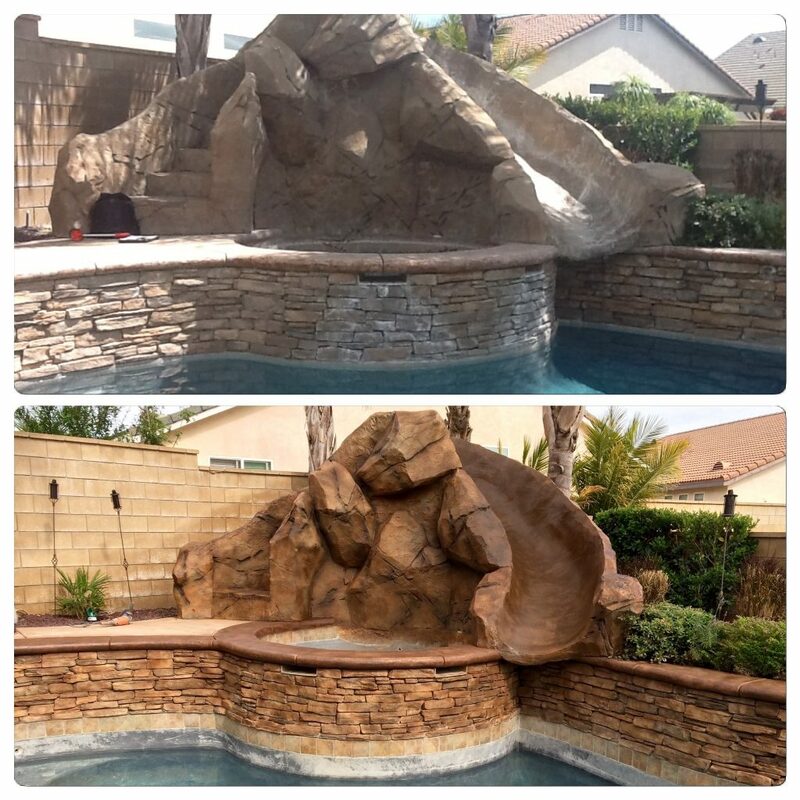 We specialize in removing all sorts of buildup and stains from tiles, rock and brick and pool tile cleaning norco without draining the pool. The pool is ready to use the next day. 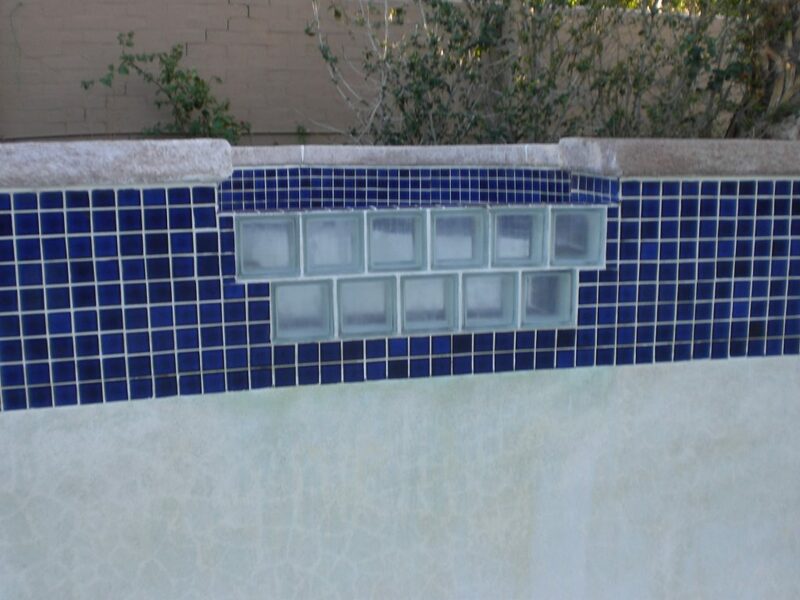 We also do Pool Tile Repair and Replacement for missing swimming pool tiles. A pool that is missing tiles is like a mouth that is missing front teeth! It looks ugly and unpresentable. So, the way a person missing a few teeth won’t get a complete set of dentures, you don’t need to replace all the tiles in your pool. 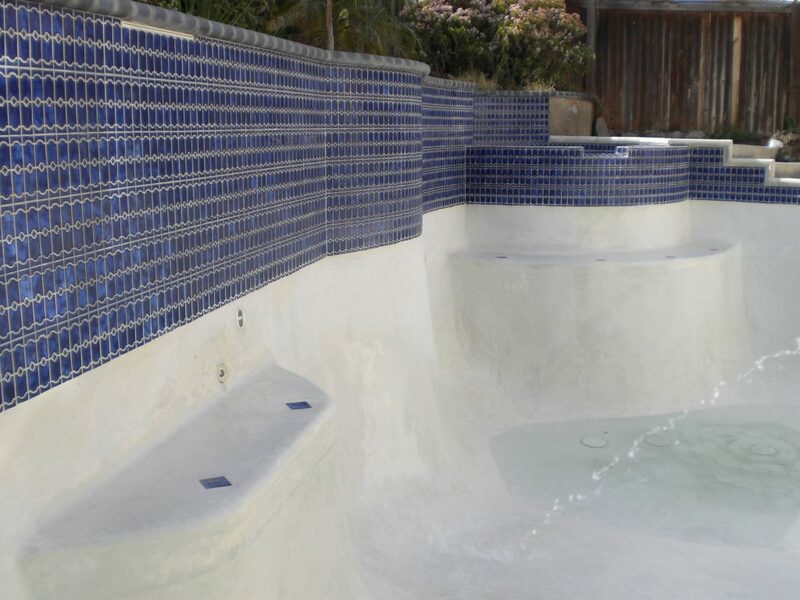 Pool Rehab can locate the same tiles for you, and if that’s not possible, we can always find a way to use tiles in a way that either complements or blends well with the existing tiles after which we could apply pool tile cleaning or mastic removal. 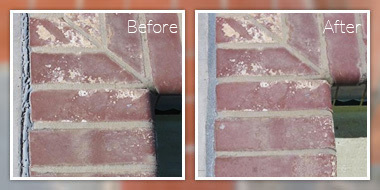 There are a number of factors that can result in the need for a tile repair. 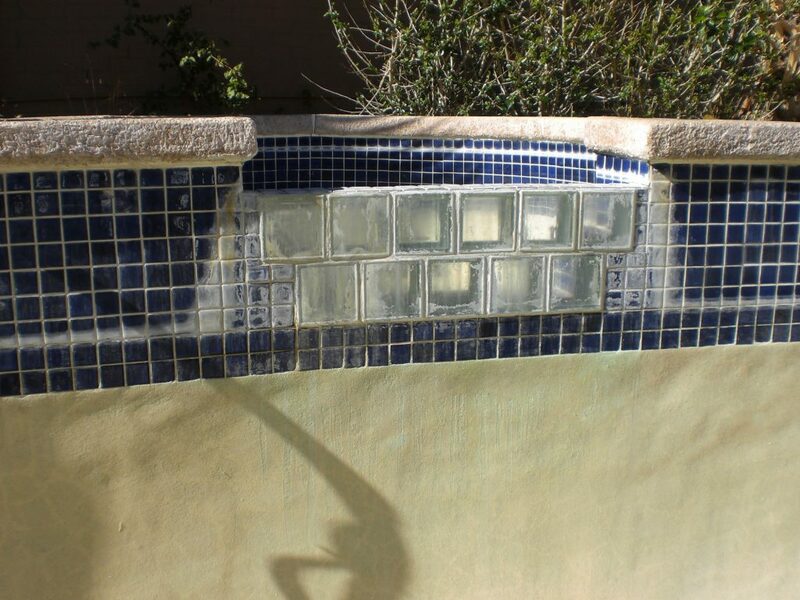 Poor craftsmanship, age of the pool tile, weather, abuse, highly frequented traffic areas, failure of tile adhesives are all examples of uncontrollable effects that inevitably cause tile damage. One of the most common situations we run across are “failure by design” repairs. 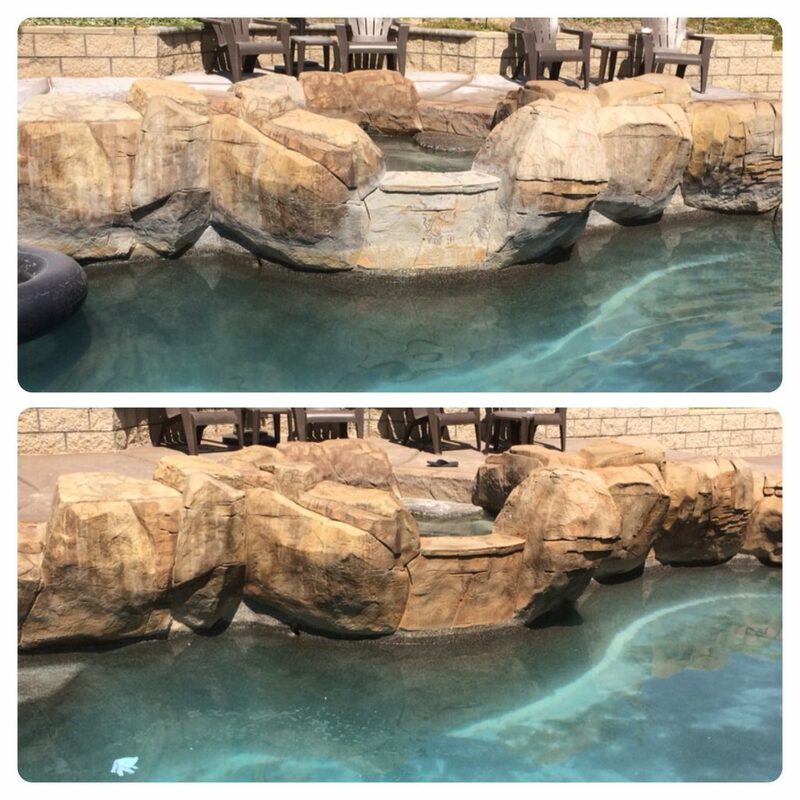 Pool builders often create such extravagant, and elaborate structures and designs for their customers, that they set aside the fact that the customer is sacrificing functionality and practicality, for expensive repairs and long term maintenance costs. Lifted bond beams and vertical walls ultimately result in Gravity taking its toll and pulling tile down into pools. This results in removal and replacement of the majority of the tile in the damaged area to the extreme of retiling entire pools and spas. We have the ability to locate most tile that is present in pools. However, there are circumstances that arise when a tile is no longer manufactured and we need to present our customer with the best cosmetic, and cost effective solution. This particular service demands skilled experience, vision, and communication with our customers to complete the job. There is an abundance of colors, types, shapes, sizes, and patterns of pool tiles across residential neighborhoods. Finding the proper tiles is always attainable, but we assist our customers in coming to a finished tile repair that can put their minds at ease and get back to enjoying their pool and spa.